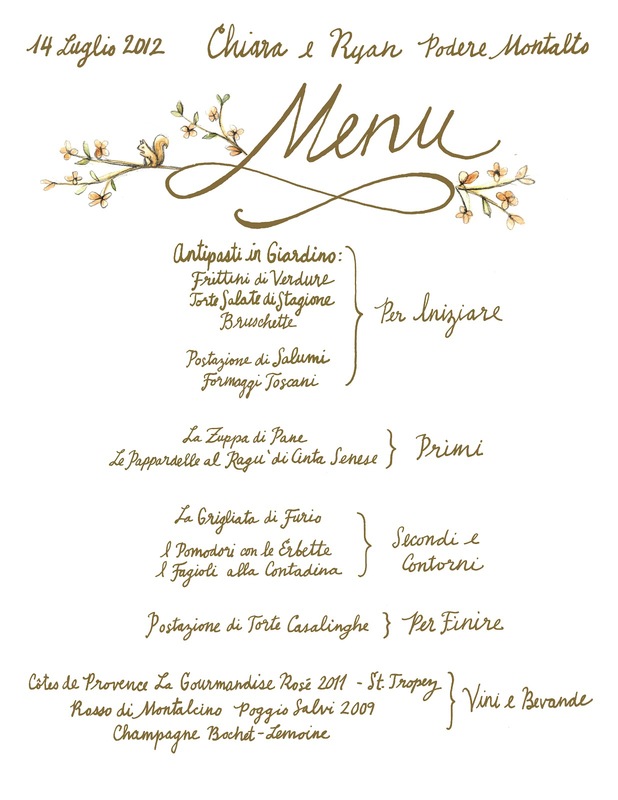 After designing and handmaking the wedding announcements and invitations for Chiara and Ryan, they asked me to also do the menu for their reception dinner in Italy. I was so happy to do this for them and it was nice to try my hand at another project. 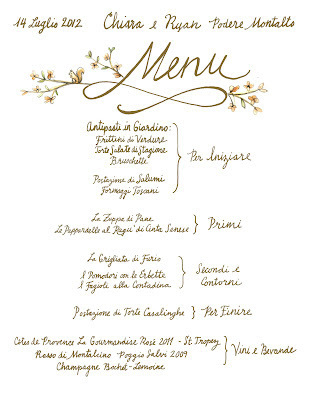 I've never done a menu like this before and there were several things to figure out. The main challenge was to fit everything onto the page in a neat and clean way. The list was pretty long when she sent it to me, everything was stacked and so it would've run off the bottom of the page had I written it like that. This had to be printed onto a 8.5x11'' letter size page, but it also had to be legible for people who are looking at it form a few feet away. What I decided to do was use the brackets in order to use more of the horizontal space and reduce the number of items in the stack. It think it works really well and makes great use of the space. The other challenge was that it's in Italian and I made several spelling errors in the first draft. I sent it to Chiara for review and she found them all, but when I corrected them I was a bit paranoid that there was something I couldn't see. It's incredible how easy it is to overlook a mistake when it's in a foreign language! Anyway, it sounds like an amazing party and I wish it was here in LA! After two weeks I have finally finished the mural. Actually, all the painting was done on Saturday but I had to varnish the whole thing, using first and isolation coat of gel medium and then two coats of MSA varnish. I found really good information about what to use on Golden's website: http://www.goldenpaints.com/technicaldata/murals.php I bought the stuff at Artist and Craftsman Supply, my favorite art store in the Boston area, located in Central Square, Cambridge. With everything I needed for the mural I went to local businesses, supporting them while creating a piece of art for the community. I have to say that varnishing was my least favorite part about the whole thing, but I got some help from Jesse for the first and last coat and I was so thankful to have an extra hand. This red thing is the fire pull alarm outside 1369's front door. Cambridge has then around the city and they are basically free-standing fire alarms. It was Josh's idea to make this drain pipe into red alarm and I think it's really cute. 1369 Coffee House is located at the corner of Cambridge and Springfield Street, which is at a six way intersection. During my days there I heard enough car horns to last me a lifetime! People generally go slow into the intersection because it's a confusing place, not to mention all the pedestrians and cyclists, and then people behind them become impatient and honk. This actually happened to me while driving through yesterday and it's pretty annoying! The ribbon cutting ceremony is supposed to be this evening but it's a dark rainy day so far. We'll see how it goes and if anything it'll be just be totally done with it. I hope to paint more murals in the future because this was so much fun and a great learning experience. I'm honored to have my work up in public in such a permanent way, it could be there for the next 20 years! I can't believe how long I've been here (a week and a half now!) but at the same time I'm surprised at how quickly I've put this mural up. I'm very close to being done, just got to finish the white outlines and do some adjustments here and there. I'm extremely happy with how it has turned out, my goal was to make an interesting and delightful picture, which is what it is. Many people comment on how much they like the colors, making me feel that I did a good job there! I'm still trying to work this part out a bit. It's supposed to be coffee cherries turning into green beans, then roasted beans, then ground coffee and then liquid. The liquid part is trick, but I'll figure it out. The owner, Josh, wanted this on the back wall. It's a bottomless portafilter with espresso pouring out. He also wanted the logo nice and clear because this is the first part of the wall people will see when are coming down the street. Someone left this doghouse, which is weird. Lots of people have commented on it and I tell them it's where I'm sleeping. Today was only a bit rainy, like spitting rain. I was able to roll up the tarp and work on the upper half of the mural, which I was itching to do since being confined to the lower half for two rainy days. I got a lot done, considering how tired you can get from just being outside for hours in the chilly air. I step into the coffeehouse frequently, trying hard not to disturb the awesome staff who work there, and get myself coffee or tea. This is what it looks like so far. Not too bad! I've pretty much finished painting the colors and have already begun adding definition and detail with the white outlines. It's so much fun! It's going to look amazing when the bicycle wheels have spokes and everything has a clear crisp look. The record player is almost done, and so you can tell what the rest of it will look like. As someone was walking by they mentioned that the arm of the turntable was on the wrong side (the left) and after looking it up I was bothered by it so I changed it. It's now on the correct side and looks lot better! Here's the 'evoluntion of the coffee bean' section. I think it's coming out nicely, though work still needs to be done. Here I am, on the ladder painting coffee plant leaves! It's raining today so I've got the tarp pulled down and can't work. I feel really good about what I've been able to do so far and think I'll definitely have enough time to finish it once the rain lets up. I'm kind of glad about the rain because I'm having so much fun that I don't want to be done too soon! I'm taking the morning off to relax a bit. I'm very tired from the painting (constantly climbing ladders and painting larger areas with a small brush). In the evening I've been seeing friends which gives me little time for rest. Last night my friend Dan and I saw Wes Anderson's new film, Moonrise Kingdom, at the local cinema (Brattle) and it was really good. It's coming along, bit by bit. Painting on this scale is an interesting experience and I have to say that it's enjoyable and challenging at the same time. One of the most difficult parts is deciding which colors go where, because it's quite a commitment. Making changes (which I've done) means a lot more work and time, sometimes repainting a large area of the wall. I've been stepping back often to see the whole picture, giving me a better perspective on what I'm doing. Being in a busy part of town, I've had a lot of people talk to me as they pass on the sidewalk or shout from their cars. All of it has been positive and encouraging and there's an overall good vibe. It's strange to be making art in a public place, but I've decided that I like it. One of the best comments was a woman who shouted 'Put the flag of Portugal on it!" and I really don't think she was Portuguese. I can't wait to draw the outlines and details in white! That'll be the last thing I do and it'll tie the whole thing together. I'm guessing that I'm still several days away from that.